The Brother CS-8072 is a sewing machine with advanced computerized capabilities. The model comes with 40 different stitches that can be used in both home decorating and garment making, along with the five different buttonhole styles that can be programmed. If you have an interest in quilting and heirloom stitching, the scallop stitch, fagoting cross stitch and eyelet stitch all create unique finished designs. Before sewing, it is important to thread the machine correctly to prevent sewing jams. Raise the presser foot to its highest position; the sewing machine has a special shutter that prevents the machine from being threaded if the presser foot is down. Press the "Needle Position" button on the front of the machine, which will raise the needle for you. 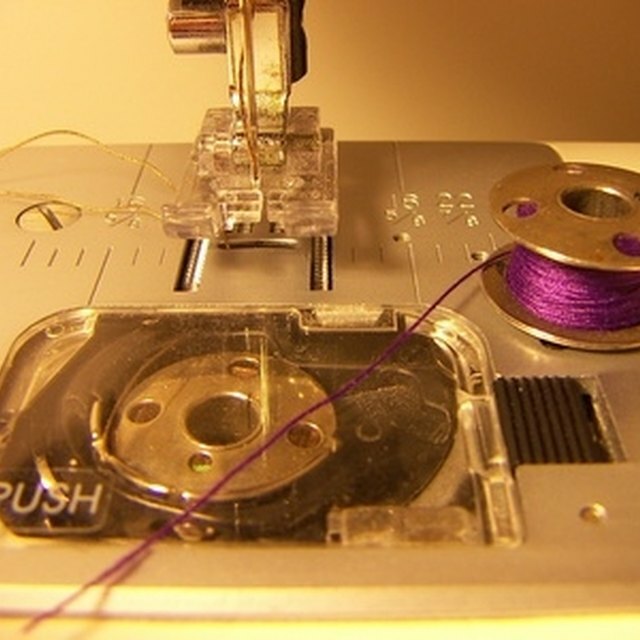 Place a spool of sewing thread on the spool pin with the thread unwinding toward the front of the machine. Pass the end of the thread through the two thread guides at the top of the machine. Thread the small right one first, then the larger thread guide at the left. Bring the thread down the front face plate, then up and over the thread hook on the take-up guide. Pull the thread back down to the bottom. Lower the presser foot to release the shutter and to allow threading of the needle. Pass the thread through the thread guide at the needle clamp, then thread the needle, going front to back. If using the auto thread device, slowly lower the needle threader lever all the way down, and hook the end of the thread down to the large threading hook on the left of the needle. As the needle threader lever is being lowered, the thread will slowly go into position for threading. Raise the needle leaver threader up to thread the eye of the needle, then pull on the end of the thread to finish threading the needle. Pull about 4 inches toward the back of the machine. The bobbin will automatically be threaded once you begin sewing. When threading the upper thread, always ensure the presser foot is raised to release the shutter, and to allow for threading through the thread guides. If using the automatic threading device, make sure you have the right needle. Only needle sizes 75/11 to 100/16 can be used with it. What Is an Automatic Needle Threader on a Sewing Machine?